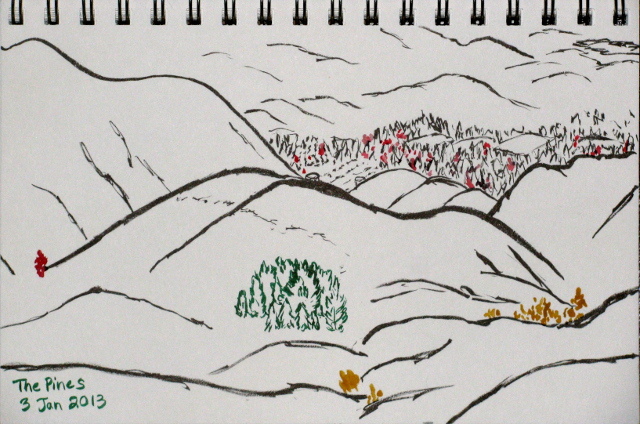 Besides the five sketches that accompany the previous entry visiting Paradise Falls in Wildwood Park, there was only one other hiking sketch for this month. The island of Coulter Pines that make up The Pines in Horn Canyon. I needed an excuse to head south for some shopping for materials to practice on for the making of a backpacking quilt, a craziness I have decided to undertake. I've found the perfect trail for the group of geeks in Thousand Oaks, but can never seem to get them to go. I decided to try it out on my own. I arrived at the main parking area at the end of Avenida de los Arboles and grabbed my supplies. There was a great electronics failure for this hike and here I discovered the first one. The camera pocket was empty. I'd left the camera on the coffee table. This wasn't so bad since I was wondering what to do with the rest of the day if I was going on such a short hike. Paper maps are available for the visitor to borrow in a box by a sign decorated with a larger map on one side and common animals on the other. I already had one printed out so attempted to head out along the Moonridge Trail only to find my route looping back to the Mesa Trail I had pointedly not taken. I've been pondering some areas up north for hiking because I really haven't tested those rocks quite enough. I saw a report that Colson was open, at least to one perfectly suitable trail head, and in shape for travel by the average car, so I headed out to it. On the way, I did check out the Paradise area for roads heading northward (none), see a great blue heron, plenty of deer, and a rafter of turkey, all without any fear of cars, and get caught waiting for some construction while there. Once getting on to the purpose of heading up Colson and finding a trail to hike. A sign near the beginning reaffirmed that the forest gate was open. I found that the road fords the creek many times, especially near the start before getting into the forest, but they are not difficult to navigate. Eventually I came to a spot that looked a bit like a trail head, although no road signs to say so, then a road to the left which seemed likely to be the campground although again without any road signs to say so. From there, I quickly came to a saddle at another junction. To the left, a road closed to the public leads up to a quarry. To the right, a road that hasn't been open to the public for a while leads down the next canyon to the north fork of La Brea Creek. It is adorned with a cattle guard and two locked gates, closed due to "recent" wildfires. I decided to head down Alejandro Trail based on it allowing for a loop that was a little shorter, finishes along a lot of good road (so says the map), and happened to start right next to where I was already parked. 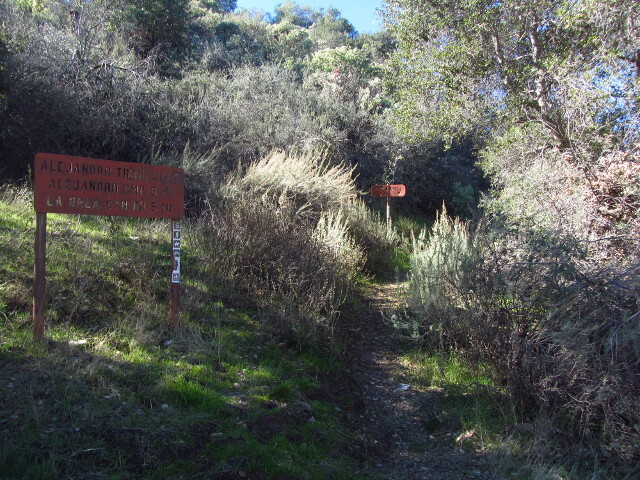 The start of Alejandro Trail: 3 miles to Alejandro Camp and 5 miles to La Brea Canyon Road. "Down" the trail turned out to actually be up, at least at first. The trail climbs up past some huge manzanita trees, one at least 10 inches in diameter, to the ridge above near a saddle with the next canyon over on a nice tread. At the saddle, it meets an old fuel break. The left looked like it was being kept open by mountain bike use but turned out to be the trail as well. The right could be hiked with minimal discomfort up to higher peaks. After trying to go for a phantom trail cut I'd seen from the peak, I checked the map and decided to follow the mountain bike tracks along the ridge. 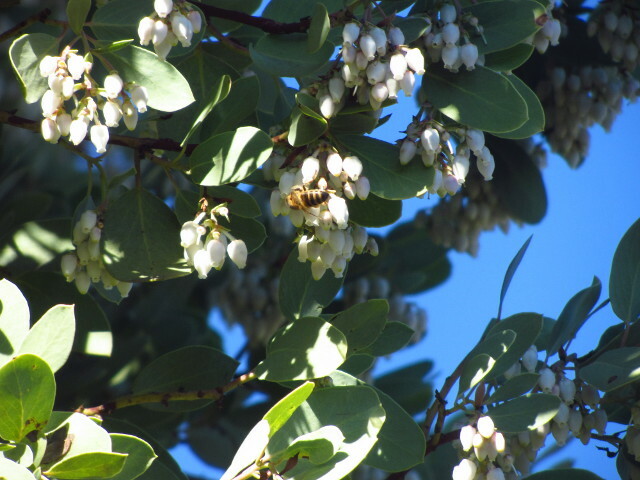 The higher up manzanita were covered in flowers and the bees were enjoying it greatly. A look out over Colson Canyon. The campground is visible as a loop of road left of center. 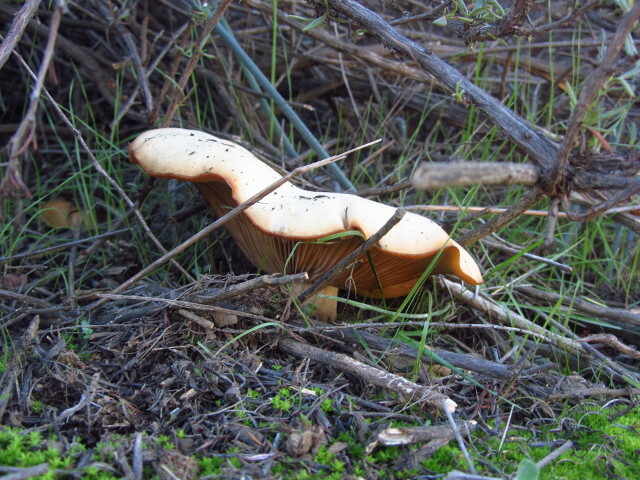 The Santa Monica Mountains are dotted with little tiny parks that tend to feed into the trail systems of the Santa Monica National Recreation Area and Topanga State Park. The HIKEtheGEEK crew decided to take a loop trail out of Temescal Gateway Park which promises ocean views and a little waterfall and to make it an animal themed thing. 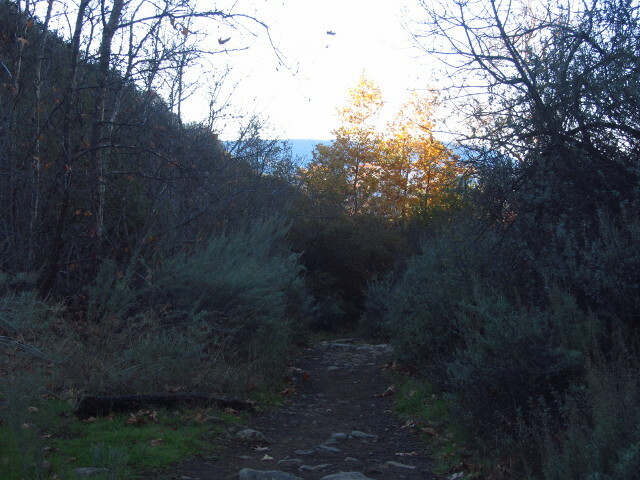 I quite like the Rustic Canyon hike that starts just a little way down the road, separated only by Rivas Canyon Park from this one, so decided to join up. There is a $7 fee for the lot at the trail, but there is a lot of parking on Temescal and Sunset as well as a number of entry points from other, smaller streets in the area. Running stop signs in the area comes with a $50 ticket from photo enforcement, which seems to be a common problem because someone took the time to mention it to me as I took a paper map from a kiosk. 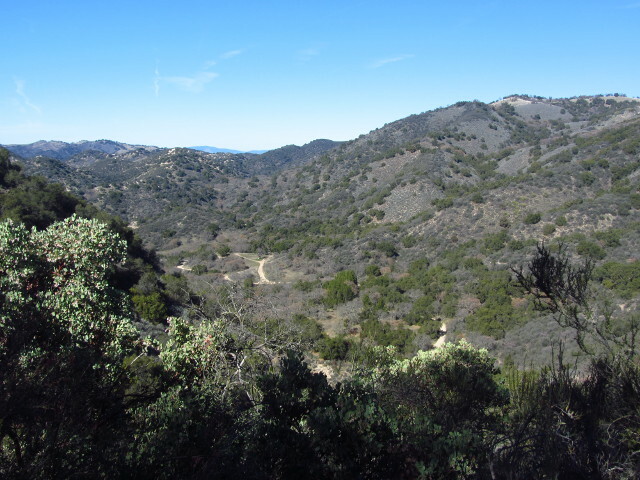 We gathered and started up along the paths next to the roadway, then turned left at the first junction to climb up onto the ridges and Topanga first. 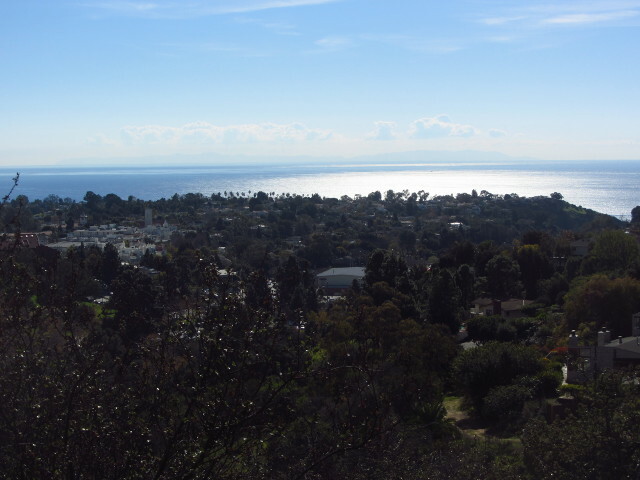 A few of the houses down below the ridge and Catalina Island in the distance.